iZend is built with a straightforward architecture designed for organizing publications and programming services in several languages, for different media, with a responsive layout. It includes a content editor, a set of presentation models, an indexing system, a search engine with an input corrector, editable comments, file downloads, secure votes, RSS feeds, HTML newsletters, QR codes, Google Analytics, a payment system (PayPal, Payline) and more. It carefully interfaces search engines and social networks. It manages a community of users with configurable privileges. iZend is written in PHP for Apache on Linux or Windows. It can use a database managed by MySQL or PostgreSQL or no database and take very little space on disk. Put online in just a few minutes a multimedia website in several languages with an attractive home page and a contact form, a website which can be shared on all social networks in one click! Edit a simple content or program a complex business process safely. iZend is distributed in several variants. The base software program is called iZend Core or just iZend. The version which is specialized for publishing a blog is called iZend Blog. 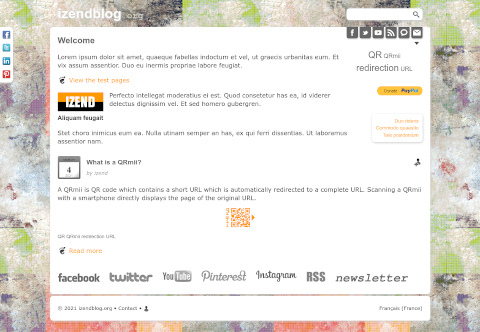 With a different look, iZend Less integrates the CSS generator Less and the Font Awesome icons. 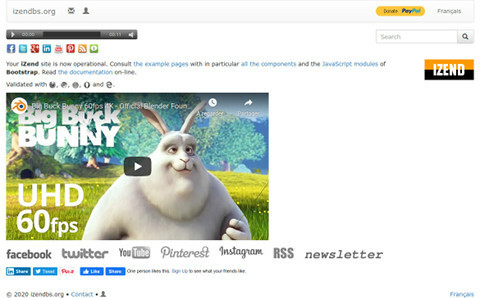 iZend Bootstrap is entirely written with the graphical environment of Bootstrap by Twitter. Start with the Installation guide to learn how to download the source code from GitHub and generate your initial website on Linux or Windows with MySQL or PostgreSQL. 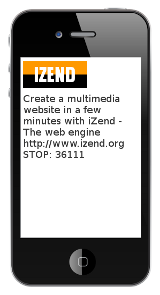 Once iZend is installed, you'll have a fast and functional website looking perfect on a PC, a tablet or a smartphone which you will be able to edit and program at will. Build step by step a commercial website which manages SMS campaigns: initializing the website, managing client accounts, editing a SMS, simulating the API of a telecom provider, sending a SMS, parameters of a SMS, list of numbers, on-line payment with PayPal, billing, interface of the SMS API by OVH. This manual will allow you to enter deeply into the code of iZend and master all its technical aspects. Learn how a request is processed by the engine from its transmission by the HTTP server to the generation of the complete final document and how the code is organized in files and folders. The file .htaccess at the root of the website configures a single entry point in the code for all requests: index.php. It also redirects all requests to the full www domain name of the website, if necessary. It can be edited to force a dialogue in HTTPS. index.php initializes the environment of the program and starts the execution of the request. The identification and registration forms can directly obtain the email address of a Facebook account and use it to connect or create a user. 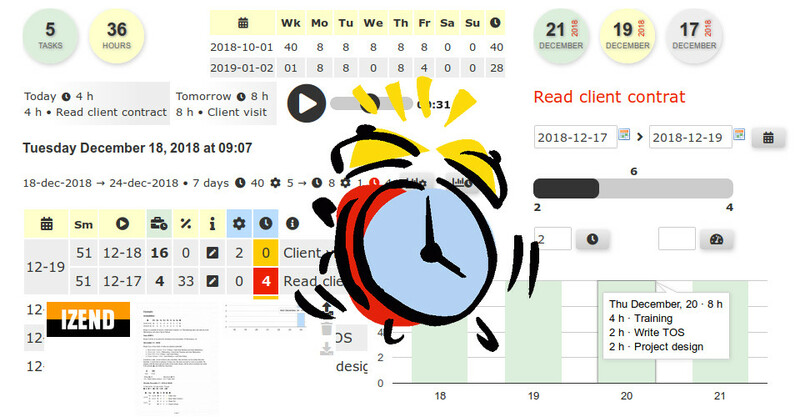 You can record all the requests to a website in a file or in the database to spot an invading robot or display statistics like the total number of visitors or the 10 most consulted pages. Draw graphics by Google Analytics of the number of visits per day for a given period on the different pages of a website. To automatically display explanations about the usage of cookies by the website, just set the configuration parameter $cookieconsent to true. Configuring a RSS feed can be limited to creating a dedicated thread whose nodes will be used to automatically build the XML document. You just need to assign the thread number to the configuration parameter $rss_thread in config.inc. You can also generate the RSS feed from several threads and enrich it with links and images. Activate payments with PayPal by editing the connection parameters to your test account and your production account. Validate accepting and cancelling a payment with the donation form. Display the balance of your account. Activate payments with Payline by editing the connection parameters to your test account and your production account. Validate accepting and cancelling a payment with the donation form. Configure the appearance of a payment with Paypal. Record payments in the database. Edit invoices. All the pages of a website can receive comments. Let me try a comment on iZend! Upload files to the server in a single operation or piece by piece while controlling the size and the type of the files. Learn how you can upload a video while watching it. The complete documentation of all the PHP functions developed for iZend. 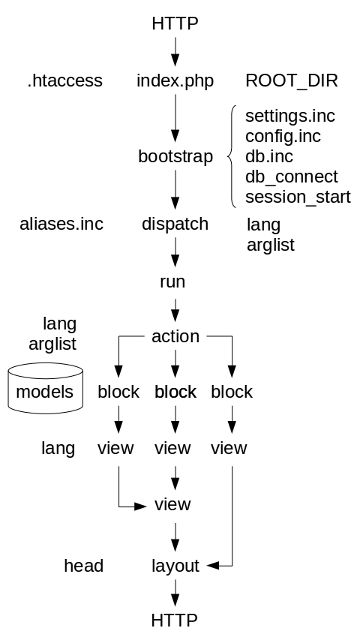 The whole MVC engine is in the file engine, in less than 300 lines of code! You want to create a QR code, encrypt URLs or exchange data in HTTP(S) with another service? Try qrencode, urlencrypt and sendhttp. The whole elaboration process of the initial code of iZend is described in the course Write a CMS in PHP. Read this manual to understand the concepts and the implementation of the MVC model and the contents editor of iZend. 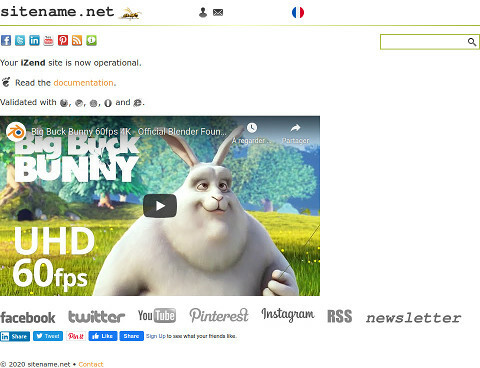 BuZZmii allows you to create, edit and put online in just a few minutes a multimedia and multilingual website in one page which looks perfect on any support. BuZZmii is also a directory with a search engine. You can freely link your page to keywords. You have a restaurant near the Eiffel tower? Associate your page with the words restaurant Tour Eiffel tower Paris and a visitor will be able to find you by typing restaurant Paris or Eiffel tower directly on the home page. A signmii attests that a document, a photo, an archive or any digital file existed at a certified time. signmii.com can code a signmii in a QR. Scanning the QR displays the content of the signmii. A QRmii is QR code which contains a short URL which is automatically redirected to a complete URL. Scanning a QRmii with a smartphone displays the page of the original URL. Download a QRmii by program in just a few lines of code. Create a dynamic link between your services or your products and your public. A QRmii is simple, fast, reliable and fun. The applications are infinite!